I’m pretty excited to write this post because it’s something I’ve been working intensively (and secretly!) on for the last 6 months. I’m talking nights and weekends and hours I didn’t even know existed. The correct answer, as you should know by now, is that it depends. It depends on how you spend, what categories you spend on, and what kinds of points (or cash!) you want to earn. And the longer I spent explaining that there is no one best credit card, spending significant time each day going back and forth with people about their spending habits so I could properly recommend a card, the more I realized that this was something begging for automation. One thing you may not know about me is that my background is in building businesses, specifically web related businesses. In fact my company, DG Interactive, started life as a web design and development firm a now unbelievable 17 years ago. It’s morphed over time but MilesTalk has become a key ingredient in my portfolio. So when I set about creating this solution I was pretty lucky to already have all of those years experience in requirements gathering, planning, user experience, and, most importantly, project management. I wanted to build a tool that could analyze how you spend and compare that to every possible available bonus category and tell you – data driven – Your Best Credit Cards. And after 6 months of planning, design, development, and more development, it’s finally ready to go…. and I’ve even got a patent pending on the software! As simple as can be, all you need to do once you land on the site is click “Get Started” and fill out a quick survey. 1) Do you want personal or business cards? 3) And are you loyal to any airlines or hotels? That’s it. And no, we won’t sell your data. You’ll also get a copy of your results in your email so you can come back later to review or adjust. If you already have several cards, the tool will most likely just validate your choices, although it may show you one that you didn’t realize was a good fit! The target market for this tool, however, is someone who is just wading in to this and would, for now anyway, prefer to only carry one or two cards. So it may appeal more to your friends than to professional MilesTalkers. Here’s my “Best Card” based on sample data entered of $1,000 per month on airfare, miscellaneous travel, supermarkets and shipping. 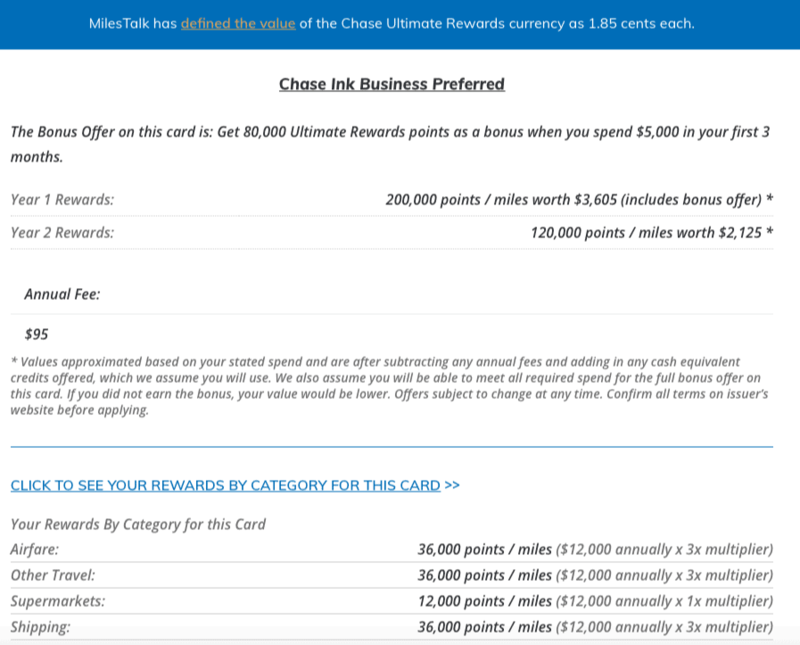 Your Best Credit Cards is, of course, a proud extension of the MilesTalk brand. 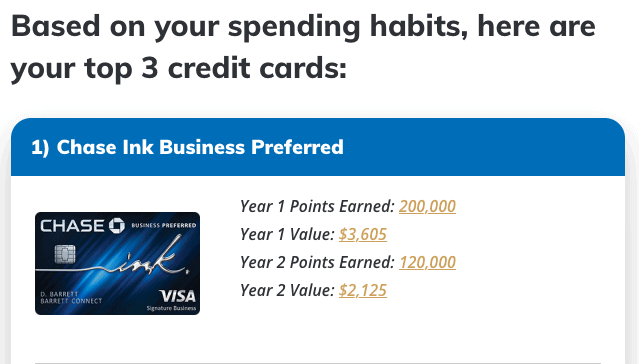 The values are based on how I value various miles and points based on an average expected minimum redemption value which assumes you take just a little bit of time to learn the best ways to spend each. I’ll be working on guides for each program to supplement. I’d love nothing more than to hear your feedback on the tool. I already have a pretty big Phase 2 planned, but you can’t get to Phase 2 without finishing Phase 1! Please give it a whirl! And even more, please share the site (there’s an easy Sharing widget on the site) with your friends and family! Feedback? Let me know here, on Twitter, or in the private MilesTalk Facebook group. Very interesting project reveal, Dave. Best of luck with the new site and we’ll look forward to Phase 2 as well! Doesn’t take into account whether the spending is US or foreign. So, useless for me. Hi Joe. The tool doesn’t care if the spending is domestic or foreign, however it only currently has US cards. We do note that Amex (and only Amex) only includes the US in bonus categories. We’d love to expand it globally (non US cards) in the future. Thanks for the feedback.